Aconcagua Update - Viento Blanco! This season we have two trips to Aconcagua under the leadership of Ben Kane who has come off of a very successful autumn campaign in India and Nepal. He is leading our January Polish Glacier and February False Polish Glacier trips. 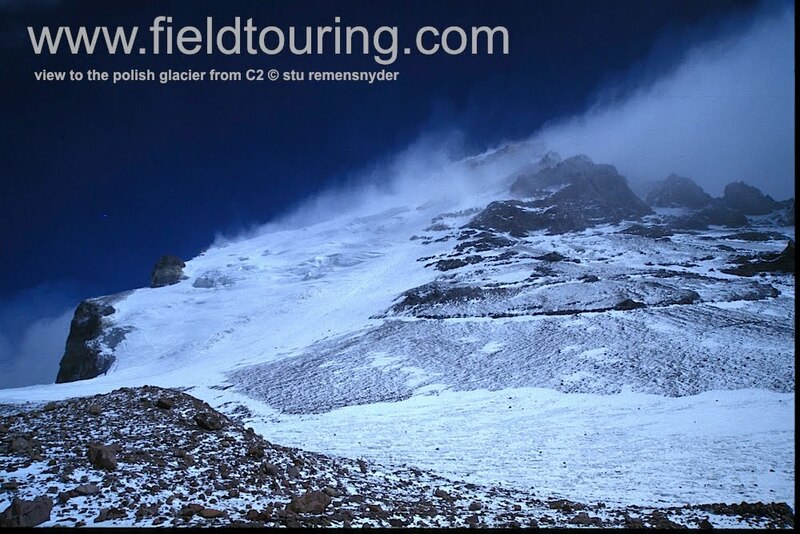 Polish Glacier update - Viento Blanco!! Ben and Ash are now back down from a strong effort on the mountain which has unfortunately been halted by very high winds (70-100kmph by some estimates) which have been scouring the mountain much of the last week. 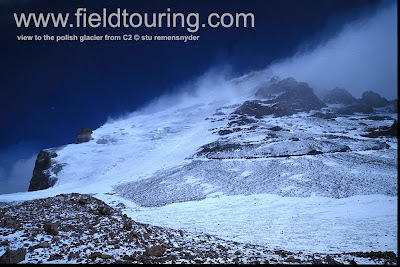 After arriving at BC, and moving well on the acclimatization portion of the climb, it became clear that the Polish Glacier was not in suitable condition due to heavy snowfall and high winds. As such they had retooled the plans to include a run up the False Polish Traverse using Camp Colera at just over 20,000ft. On the 23rd they pulled into Colera and were met with high winds which made even establishing camp a serious challenge. 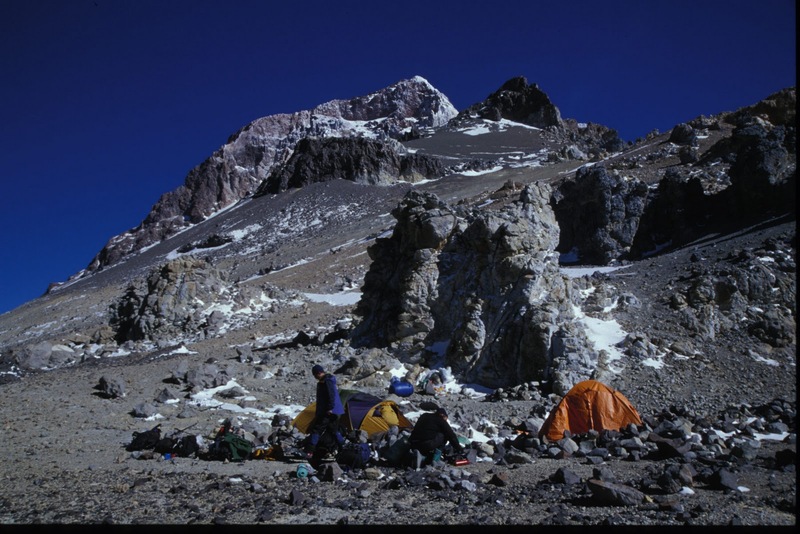 They then spent a very uncomfortable night with the tent being heavily buffeted by the infamous "viento blanco" or "white wind" which, at its worst, can be easily strong enough to lift and throw tents filled with climbers and gear. The next day they beat hasty retreat to BC and are beginning to make their way back out to town today. We'll look forward to hearing the full details and sharing the story along with new images shortly. There are always great lessons to be learned from surviving challenging conditions and with Ben's experience on Broad Peak, Cho Oyu, Ama Dablam, Satopanth and more we know that Ash was in good hands! We have a great group of 6 climbers joining us for a Feb 2 start in Mendoza and we'll hope they have a calmer wind for their trip. They will be following the same route as our Jan 10 group with a beautiful trek up the Vacas Valley, turning up the relinchos valley and basing themselves in Plaza de Argentina. Our February 2 team will be going a bit lighter than the Jan 10 Polish team with no ropes, ice axes, ice screws, stakes etc to carry! If all goes well they will plan for a traverse over to the Plaza de Mulas BC after summiting from either C2 or from Colera. The summit plus traverse makes for a fantastic trip and the majority of our teams are able to make this itinerary. The advantage to this route is that you can enjoy more solitude with the quieter approach of Argentina but then take advantage of some of the amenities (beer and burgers!) on the Mulas side on the way out. Spots are filling up for summer trips to Noshaq, Broad Peak, K2, G2 & Spantik. We hope to confirm all 5 trips, plus a trek to K2 BC, in the next month or two. We are already taking applications for Autumn trips to Stok Kangri, Satopanth, Cho Oyu, Ama Dablam, Khumbu Peaks and Everest BC trek. Let us know how we can help you with an adventure in 2012!